Bathymetry is a digital image of the undersea land surface and water depth. Bathymetry is the underwater equivalent of land topography. In the maps provided here, shading indicates changes in slope or depth. 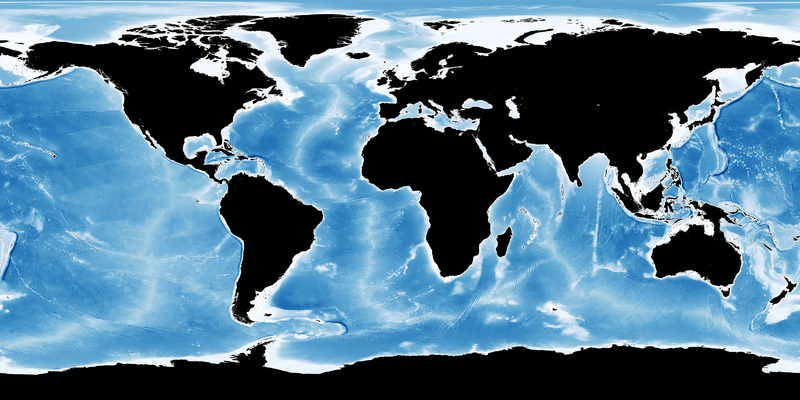 Much of the data on ocean bathymetry come from "soundings." To collect a sounding, scientists use sonar devices to emit a sound wave that passes into the water. By measuring how long it takes the sound wave to bounce off the ocean floor and return to the sonar, scientists can estimate the depth of the water. Other characteristics of the returned sound wave can help reveal the shape and size of features on the sea floor. These images represent ocean depths between -8000m and 0m (surface). Land regions are black in the colored versions. The full resolution of these images has been broken up into tiles as listed below. To understand the naming scheme please read about our global image grid.